Online slot machine games seem to be getting better and better as time goes on. The animations and sleek gameplay of these online slot machines are constantly improving. One of the latest releases from Playtech Gladiator is no exception to this notion. Many online slot games are based on movies. Gladiator is just another is this exciting series of games to stay within this trend. The game uses some scenes from the movie to help add to the overall theme of the game. It even has sound bites from Russell Crowe to help supplement the action and the gameplay. The game is very exciting and attractive to online slot machine gamers because it provides over 200 ways to win. 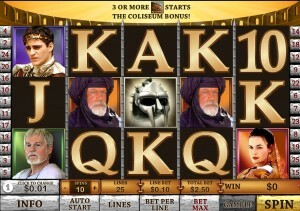 Many of those that play at slotsclub.com say that Gladiator is the most fun online slot game that they have ever played. It is a great take on the classic slot machine game to offer those playing more enjoyment than ever before. 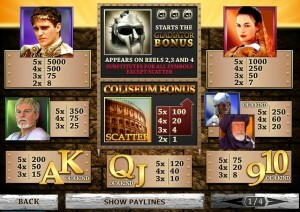 Gladiator is a 5 reel, 25 pay line game. You will be familiar with often used playing card symbols that are you used on all of the reels. Playing cards from 10 to the Ace card are the lowest valued symbols to appear on the reels during gameplay. There are also more valuable symbols based on the Ridley Scott movie that everyone will recognize, 1 wild symbol, and 1 scatter. One thing that sets Gladiator apart from other online slot machines are the bonus games that it offers. It also offers players extra betting features as well where they can bet their winnings and double their earnings on the game. The gladiator mask is the most important symbol in the entire game. It only appears on the second, third, and fourth reel of the slot machine. It can replace any symbol on the board except for the scatter symbol. When you get 3 gladiator masks on one spin you earn a bonus game. In the bonus games, you automatically win money. The amount is the only thing that changes from game to game. There are 9 different masks that can appear during the bonus game. Each one is worth a different amount. The game adds up the amount and you are awarded that as a prize. It’s as simple as that. 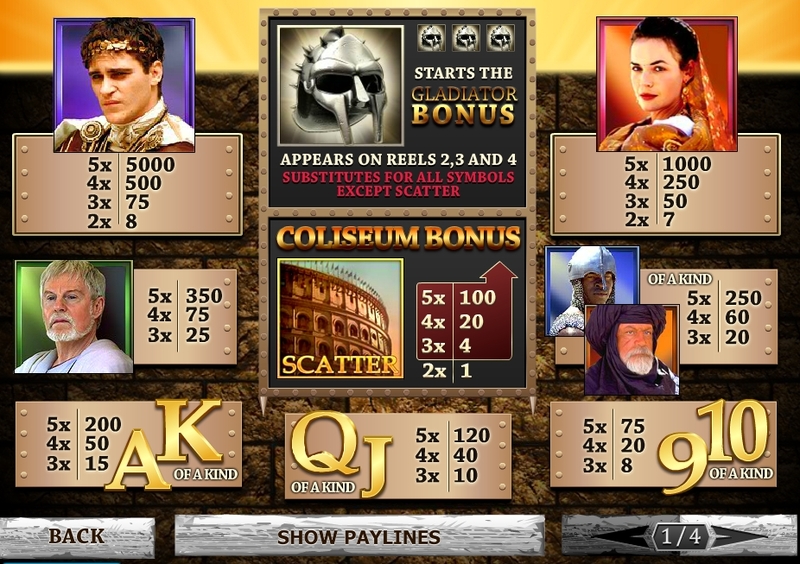 These bonus games are what makes Gladiator so much fun compared to other online slot machine games on the internet. Some say it’s even as fun as playing the Vegas slots. When it comes to online slot machine games, Playtech really hit the mark with Gladiator. The game combines all of the classic fun of playing free online slots with some advanced animations and some fun tweaks in the gameplay. The bonus games are the most interesting part of the game. Anytime you earn a bonus game you are sure to win money and add to your overall winnings. 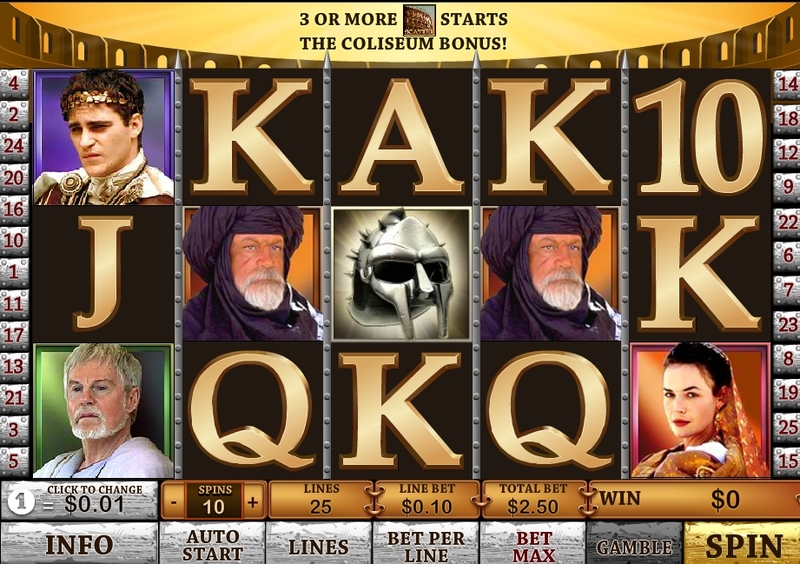 Many customers choose to play Gladiator online because of the 5 reel, 25 pay line opportunity. Others like to play it because there are so many ways to win. Everyone that plays it seems to enjoy the game for its world class animations and clips taken straight from the original movie starring Russell Crowe.